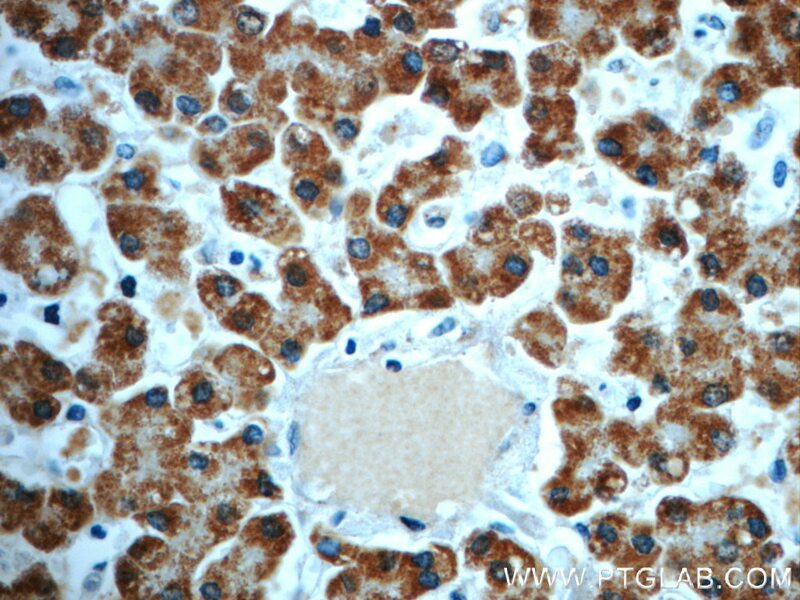 IP Result of anti-PCCA (IP:21988-1-AP, 4ug; Detection:21988-1-AP 1:1000) with L02 cells lysate 1800ug. 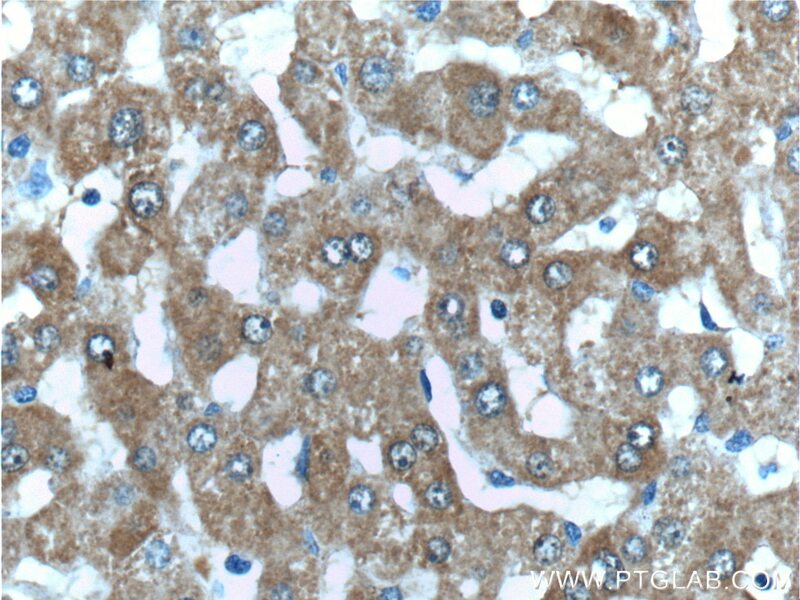 Immunohistochemical analysis of paraffin-embedded human liver tissue slide using 21988-1-AP( PCCA Antibody) at dilution of 1:200 (under 10x lens). 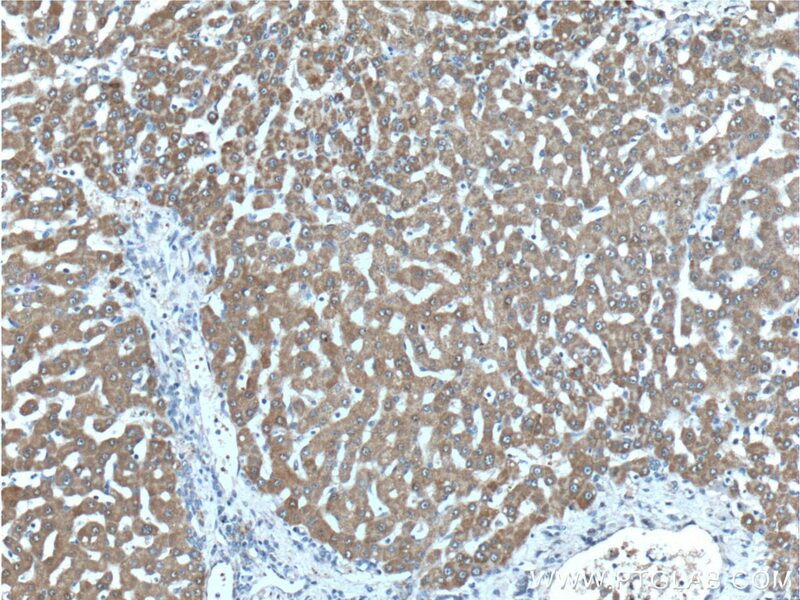 Immunohistochemical analysis of paraffin-embedded human liver tissue slide using 21988-1-AP( PCCA Antibody) at dilution of 1:200 (under 40x lens). Propionyl-CoA carboxylase (PCC) catalyzes the biotin-dependent carboxylation of propionyl-CoA to D-methyl-malonyl CoA, a reaction that occurs in the mitochondrial matrix. PCC is involved in the catabolism of several essential amino acids (methionine, isoleucine, threonine and valine), as well as odd chain fatty acids and cholesterol. 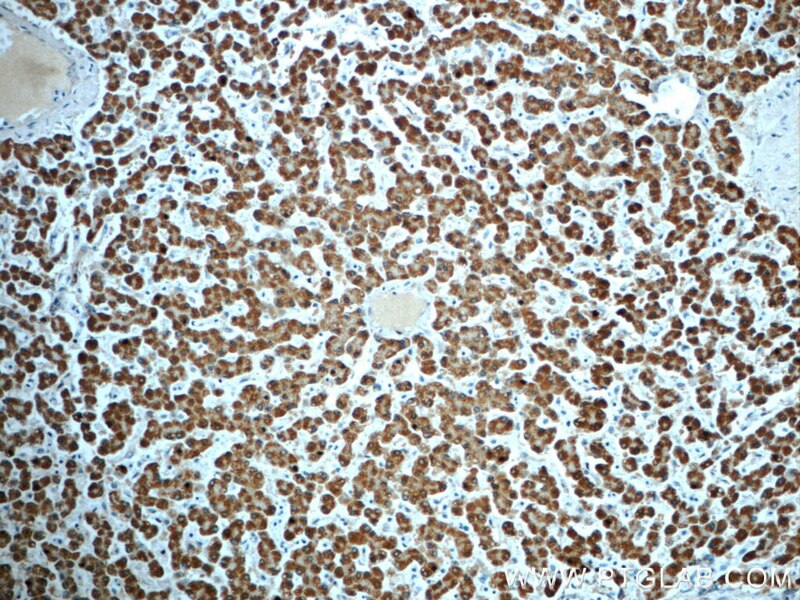 Deficiency of PCC results in propionic acidemia, a metabolic disorder characterized by severe metabolic ketoacidosis, vomiting, lethargy and hypotonia. PCC consists of nonidentical subunits (α and β) encoded by different genes (PCCA and PCCB, respectively). The αPCC cDNA contains an open reading frame of 2106 nucleotide bases and codes for a 702 amino acid polypeptide. 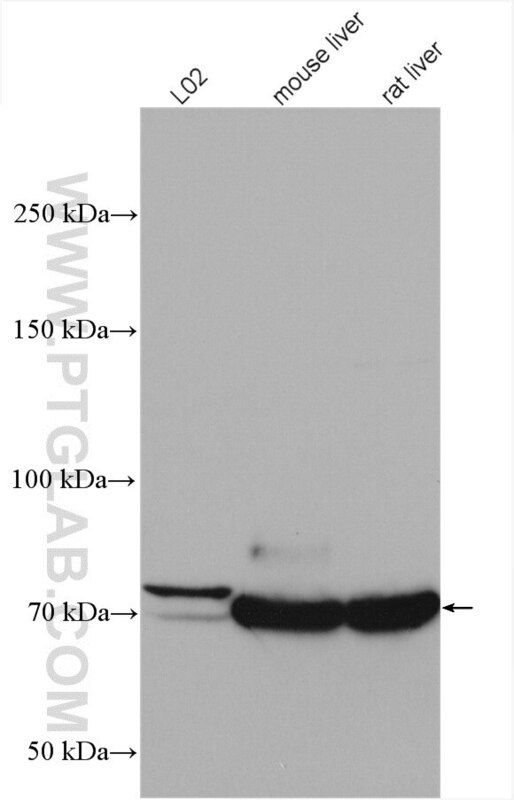 The mature length subunit is 70 kDa and contains the biotin binding site.(PMID:8852656). 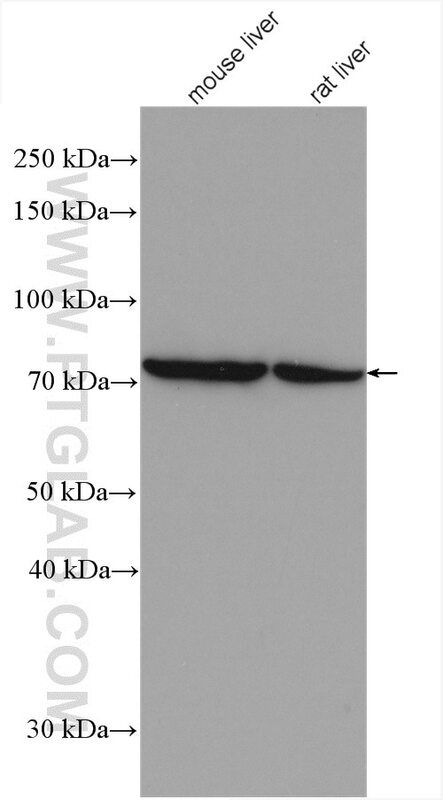 This protein has 3 isoforms produced by alternative splicing with the molecular weight of 80 kDa, 77 kDa and 75 kDa. The full length protein has a transit peptide with 52 amino acids which will be removed in mature form. 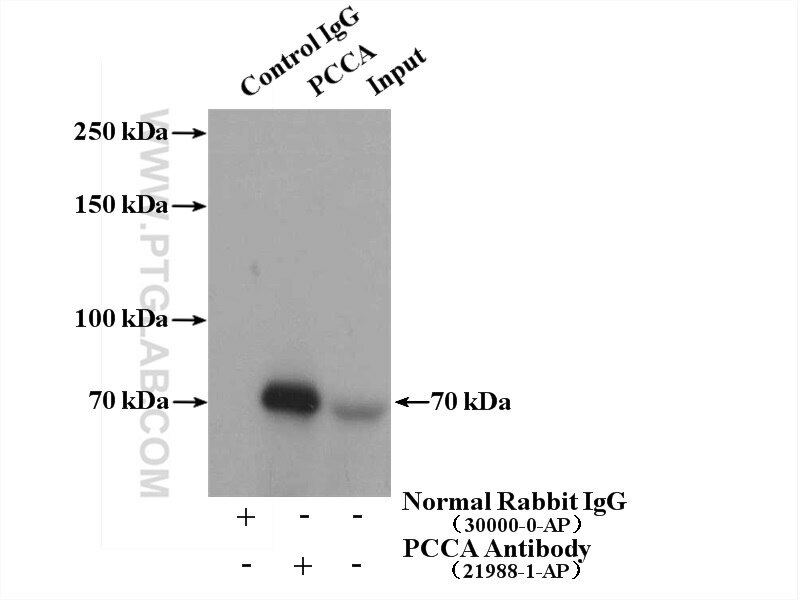 This antibody is specific to PCCA. CLUH regulates mitochondrial metabolism by controlling translation and decay of target mRNAs.